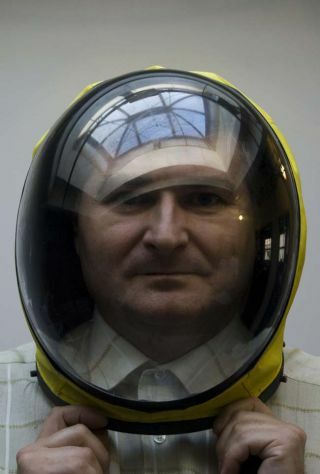 Co-inventor Nikolay Moiseev poses in the helmet of the new spacesuit he designed with partner Ted Southern. The two plan to unveil their spacesuit July 16 in New York. Full story. NEW YORK - Two inventors, one American and the otherRussian, plan to unveil their new spacesuit design Friday in New York. The new cosmic suit is designed to be worn inside aspacecraft during launch and re-entry, and is fully pressurized and includeshigh-tech gloves and a dome-like space helmet. Moscow-based spacesuit engineer Nikolay Moiseev andBrooklyn-based inventor and artist Ted Southern teamed up to create the suit ina partnership they've dubbed Final Frontier Design. They plan to unveil theircreation Friday at 6 p.m. EDT in New York at Eyebeam, an art-technology forum. The team will demonstrate the pressurization of the suitwith a burst test, where the suit's arms and legs are pumped full with wateruntil they reach their breaking point. "We'll show the suit can withstand many times over thepressure its intended for," Southern said. A vacuum chamber glove box will also be available for gueststo test out what it's like to work with their hands inside the gloves. The inventors don't have any customers yet for their suit,but hope to eventually attract commercial space companies such as SpaceX,Orbital Sciences and Virgin Galactic, which are currently working on buildingthe first private ships capable of flying humans to space. Southern and Moiseev originally met as competitors in the firstNASA-sponsored Astronaut Glove Challenge in 2007, which offered $200,000 to inventorsable to build a spacesuit glove that improved on the current NASAspacesuit design. Southern and Moiseev teamed up after that competition andtogether won second place ? and $100,000 ? in the 2009 astronautglove challenge. Their new suit, though designed for functionality, is alsorather fashionable, Southern said. "The suit is bright yellow for visibilityreasons, but there's a certainly aesthetic to that that is fashionable Iguess," Southern said. "And the design of the helmet is a functionalone but it ends up being good-looking too."